One of my favourite things to eat whenever I visit Bangkok is khao kha moo, or braised pig trotter rice. The humongous pots the trotters are typically cooked in grab my attention each time I walk by a khao kha moo stall and the smell of the meaty gravy is always so inviting. The dish, however, is harder to find in Singapore, where Thai food usually equates to the ubiquitous tomyum soup or basil pork rice. I Google for the dish here and discover that a six-month-old stall in Beach Road serves it, so I make a beeline for the place. It is run by three 23-year-olds, who learnt to cook from Internet recipes after being wowed by Thai street food on one of their holidays. I visit the stall, which is in a coffee shop, during a weekday lunch hour, and the queue is already 10-people deep. It takes almost half an hour for me to reach the front and, by then, I am starving. I feel greedy and end up ordering the pig trotter rice (from $5.50) as well as the stall's only other offering, Thai-style wonton mee (from $4). I quickly dig into the rice dish first, and it is delicious. The portion is generous, with plenty of pig trotter laid out on top. The meat is cut up in chunks, rather than the usual long sliced version I get in Thailand, but it is still very tender. The savoury pork, which is braised daily with spices such as star anise, goes well with the housemade chilli sauce served on the side. The preserved vegetables and braised hard-boiled egg that come with the dish balance the strong meaty flavour. My only complaint is that the pork skin is too gelatinous and hard, when it should be soft and melt in the mouth. 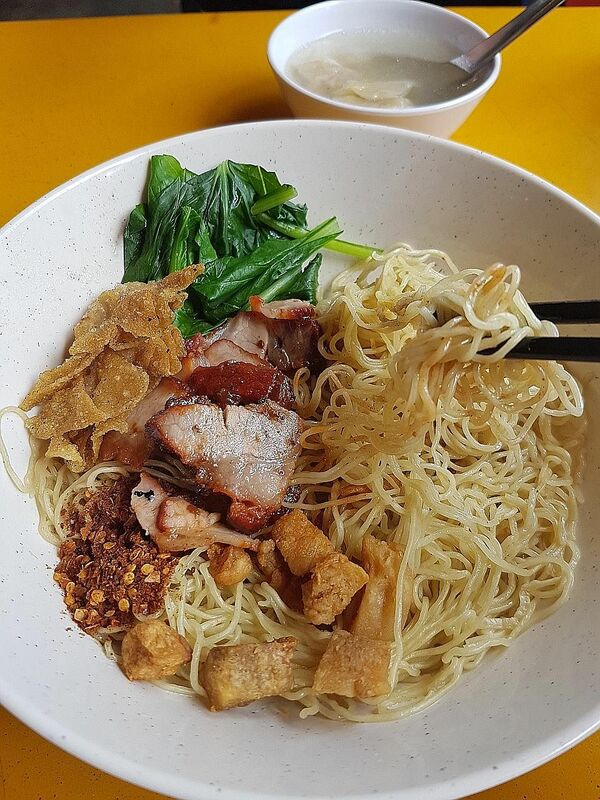 The wonton mee is also good, although it is extremely high in calories. It is done Thai-style, which means the noodles are tossed in lard and topped with fried lard. I should not have been too surprised, given that the name of the stall is Fatty Thai. I hear some customers at a nearby table mumble about it being too dry and that they prefer the Singapore version, which has more sauce. But I think the dish, which comes with tender pieces of char siew, fried wonton as well as a soup wonton on the side, works. Do not be fooled by how pale the noodles look - they are full of flavour. Aroi mak (very delicious in Thai).